34 arts projects over five years. Making the Jurassic Coast the most creative coast in the world. The Jurassic Coast is a UNESCO World Heritage Site in Dorset and Devon. The Creative Coast was their specialist public arts programme that ran over 34 arts projects over five years. We helped to create a visually engaging case study brochure to appeal to potential funders and academics. 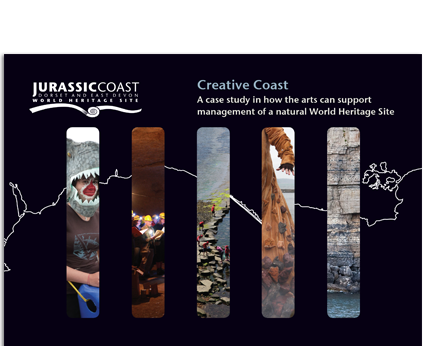 As the Creative Coast programme drew to a close, Jurassic Coast required a printed case study to document and demonstrate the effectiveness of the project. Although the programme itself was art-based, the case study was aimed at funders and academics and the content was primarily data-driven. Jurassic Coast commissioned us to design a 40 page brochure, and to find a visually creative and engaging way to present the content. We worked with the printers to develop an engaging “pull-out” tabbed front cover, which slides between a map of the Jurassic Coastline, and photos of the arts projects themselves that correlated with the various locations. On the inner cover, the “pull out” reveals fossil illustrations, which line up with the places where they can be found on the coastline. Inside we presented the content in a clean and accessible format, with lots of images, illustrated references to the fossils and geographic locations, and a colour coded content structure. We also created supporting materials for the brochure, such as business cards, for the Creative Coast team to use when presenting it to UNESCO partners.